Yesterday, I pulled the mother from the fridge. It was frothy with bubbles laced with hooch. I weighed out 105 grams (g), exactly half the 210g that Mike of Sourdough home says I need to make 100 percent whole wheat sourdough bread. Then I fed the starter. To my starter, I added 52-53 grams each flour and water, which should exactly double the volume, and set it in the oven. Fog and rain chilled the air here in San Francisco yesterday morning, and we could feel it in our unheated apartment. To bring the incubating temperature up a bit, I switched on the oven light. After four and a quarter hours, the starter had almost doubled. Odd cracks seamed the top. You can’t see in these images, but through the glass sides, I could see lots of bubbles. At the five-hour mark, fault-lines crisscrossed the fully developed starter. The surface was uneven, with bubbles popping as I snapped the photograph. Time to mix the dough! Just in case, I measured the starter. So glad I did! Apparently, when the gas releases bubbles, we lose a little volume. Makes sense, right? A few grams short of the amount I needed to make my loaf, I added enough refrigerated starter to make up the difference and hoped for the best. After the kneading fiasco the other day, I decided to use my stand mixer to mix and knead the dough. Pouring the starter into the bowl, I weighed and added water, salt, oil, honey and flour and mixed it with the paddle. No pix, though. I totally forgot to stop and take some! Once the ingredients were thoroughly combined, I switched to the dough hook and kneaded five minutes, then let the dough rest five more minutes. Mike says this helps hydrate the flour. After the rest period, I ran the mixer again, kneading about five minutes, until the dough had pulled away from the sides and was tacky to the touch. When I did the windowpane test, I easily pulled a mostly translucent film about two by three inches before it began to tear. Good enough? We’ll find out. The dough was fairly wet, but workable, and I soon had a nice ball. Happily, it was elastic enough to stretch a long tail around the ball, which Mike says helps to stretch the gluten strands so they can form bigger gas pockets. I fixed the lid and set the bowl in the refrigerator to cold-proof overnight. By 9:45 this morning, my dough had doubled. I punched it down gently and shaped it into a ball, stretching the dough again as much as I dared. Covering the ball with a piece of wax paper to prevent the surface drying out, I set the bowl in the oven with the light on because the apartment was chilly. Three hours later, the dough had doubled. Woo hoo! This is the lightest, softest whole wheat dough I have ever made! Now, I have to admit that I’m chary of handling the dough too much, so I folded the dough into a loaf shape quickly and popped it into my butter-greased cast-iron pan and back in the oven to rise. Ready to rise third and last time! The sun came out, balmy breezes beckoned, and the two-year-old and I went out for a walk. When we returned a couple of hours later, the dough just peeked over the top of the pan about a quarter-inch. Looking at Mike’s photographs, I decided the dough hadn’t risen enough and set the timer for 30 minutes more. Uh oh. Too long. The dough collapsed and had cracked on the side, where a bubble burst, letting out the gases and deflating the top of the loaf. Aaargh! While I waited for the oven to heat, I scored the top of the loaf with the new ceramic knife I bought just for this purpose. I’ve read that other bread makers have good luck with this type of knife. Me? Not so much. My efforts to score the dough only further deflated the bread. Oh well. (Sigh) When the oven reached 350 degrees Fahrenheit, I popped my ugly creation into the oven. Thirty minutes later, again following Mike’s advice, I removed the loaf and checked the color. If the loaf is pale, he says, turn the heat up twenty-five degrees. If it is already browning. turn it down. I lowered the heat and popped the loaf back in the oven. Fifteen minutes later, the loaf thumped nicely when I tapped its bottom with my finger after removing it from its pan. To be sure this time, I turned it over and took its temperature. Slightly over 200 degrees Fahrenheit. Done! But oh my, just look at that top. It looks like parts of Nevada when you’re flying over on a clear day at 30,000 feet. Still take a look at the side! Lots and lots of bubbly holes in various sizes. Maybe this loaf will turn out okay, even if it is ugly. It’s dinnertime at our house and we can hardly stand to wait for the bread to cool. After forty minutes, we cut into the still warm loaf. Probably should have waited till it was stone cold. It’s a little doughy on one side and on the bottom, but it tastes mighty fine. We couldn’t wait and cut the loaf while it was too warm, but oh so tasty! The crumb is more dense than I hoped, seeing those bubbly sides earlier, but we do have a few nice holes here and there. The sourdough flavor is much milder than with the first loaf, still a bit on the bitter side, but closer to the taste I crave. Tomorrow, I will start again, trying out a few new tricks. America’s Test Kitchen, for example, advises baking sourdough loaves until the internal temperature is 210 degrees F. They also recommend cold proofing the last rise in the refrigerator overnight, but not the first two rises. I’ve already fed my starter in preparation for making the sponge. 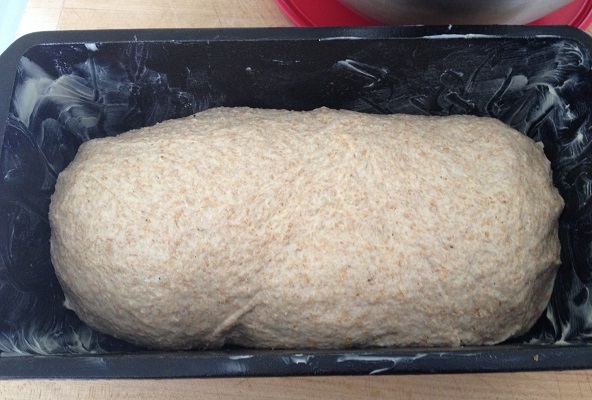 Before I sleep tonight, I’ll mix the dough in my stand mixer, as I did this loaf.